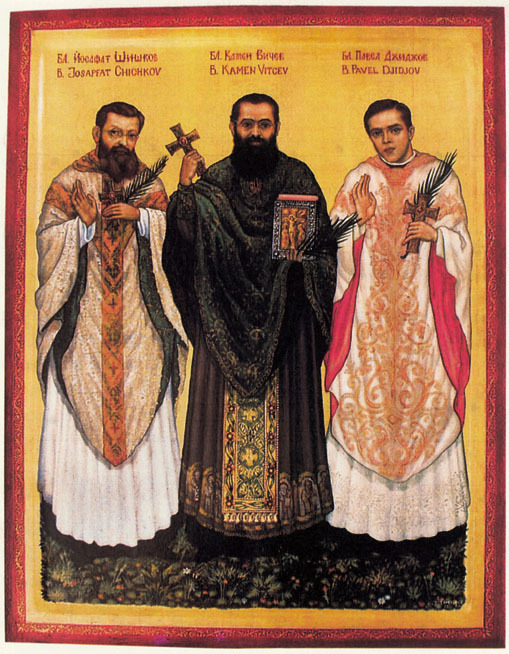 At Plovdiv, on Sunday, 26 May, the Solemnity of the Holy Trinity, the Holy Father beatified three Assumptionist priests (Augustinians of the Assumption), Kamen Vitchev, Pavel Djidjov and Josaphat Chichov as martyrs for the faith. As the Communist archives now reveal, their martyrdom took place at the hands of a firing squad on 11 November 1952 at 11: 30 p.m. in the central prison of Sofia, Bulgaria. With them the Passionist Bishop of Nicopoli, Blessed Eugene Bossilkov was also shot. Fr Kamen Vitchev was ordained for the Eastern Rite, Frs Pavel Djidjov and Josaphat Chichov were ordained for the Latin Rite. All three were known for their talents in the field of the education of the young, ability to generate vocations, and one showed great skill in the the formation of future priests and religious. They also knew how to write and placed articles in Catholic and other magazines. They were also friends of the Apostolic Visitator of the time, Archbishop Roncalli, now Blessed John XXIII. On account of their influence, they were singled out by the Communists for special attention. Their example of faith and constancy in the face of suffering and imprisonment are well remembered by their students (Catholics, Orthodox, Jews and Muslims alike), parishoners, the religious who knew them, and by their prison companions. Kamen Vitchev was born in Strem, Diocese of Thrace (department of Bourgas) in Bulgaria on 23 May 1893. His parents belonged to the Eastern Rite Church. He was baptized Peter. He attended school in Strem and in 1903 was accepted into the grammar school of Kara-Agatch in Adrianopoli where he continued his studies until 1907, when he moved to Phanaraki (on the outskirts of Istanbul) and remained there until 1909. On 8 September 1910 he began his novitiate with the Augustinians of the Assumption (Assumptionists) in Gemp and received the name "Kamen". He made his final profession in 1912 in Limperzberg. He began his ecclesiastical studies that same year and in 1918 he was made professor at the College of St Augustine in Plovdiv and then at the Little Seminary of Koum Kapou in Istanbul. In 1920 he returned to Louvaine to complete his studies and the following year he was made professor of theology in Kadiköy where he taught until 1925. On 22 December 1921 at Kadiköy (a suburb of Istanbul), he was ordained priest in the Eastern Rite. In 1927 he went to Rome and Strasbourg to continue his studies and in 1929 he obtained a doctorate in theology. In 1930 he went back to the College of St Augustine in Plovidiv, Bulgaria, where he was eventually college rector, dean of studies, and lecturer in philosophy until the Communists closed the school on 2 August 1948. Fr Kamen had a seemingly "severe" nature, and he governed with authority; his students, however, had a deep respect for him. He did much for ecumenism and interreligious dialogue, and welcomed to the school all believers without distinction; Orthodox, Catholic, Armenian, Jews and Muslims lived together in perfect harmony. He was often asked to give lectures on issues regarding young people and social life. He wrote articles for the magazine Istina and for the "Review of Byzantine Studies". He also published numerous articles for scientific newspapers and magazines, using different "pen-names". In 1948, when the college was closed by the government authorities, Fr Kamen was named superior of the Seminary of Plovdiv. In 1948 when all foreign religious were expelled from Bulgaria, he was appointed Provincial Vicar of the Bulgarian Assumptionists. There were twenty of them; they staffed five Eastern Rite parishes and four Latin parishes. In a letter sent to the Superior General, Fr Kamen foresaw a terrible future: "The Iron Curtain becomes increasingly thick, without doubt, they are preparing dossiers on Catholic priests ... ". On 4 July 1952 he was arrested, accused of heading a Catholic conspiracy against the State. There was no news of his whereabouts until on 20 September when the newspapers published an accusation against a list of 40 people condemned as "spies for the Vatican and the French and conspirators, seeking to foment an imperialist war against the USSR, Bulgaria and the Popular Democracies". Fr Kamen was on this list as the organizer of the conspiracy. Pavel Djidjov was born on 19 July 1919 in Plovdiv, Bulgaria, of Latin Rite parents. His baptismal name was Joseph. From 1926-1930 he attended the Assumptionist St Andrew's School. From 1931-1938 he continued his studies at the College of St Augustine in Plovdiv. On 2 October 1938, he entered the Assumptionist novitiate of Nozeroy, Jura, France, where he took the name of Pavel. On 8 September 1942 he made his final vows. He was an outgoing young man, athletic and practical with a good sense of humour. He dedicated most of his time to the education of young people. After his vows, he had to return to Bulgaria because of illness, and remained there doing his theology studies outside of class. He was ordained a priest for the Latin Rite on 26 January 1945 in the Cathedral of Plovdiv. He moved to Varna, on the Black Sea, where he taught and continued his studies in business management and social sciences. He was made treasurer of the College of St Augustine when Fr Kamen was rector and stayed there until the college was closed in 1948. In Varna he was active among the students and did not hide his anti-Communist sentiments; for this reason he was closely observed by secret service agents. In 1949 he was made treasurer and procurator of the Bulgarian Assumptionists and showed great courage in defending the rights of his Congregation and of the Church. At the time the Assumptionists were without funds; their colleagues the French Assumptionists tried to send money through the French Ambassador. A month before his arrest, Fr Pavel commented on the arrest and condemnation of several priests and wrote: "May God's will be done. We await our turn". On the night of 4 July 1952 he was arrested together with Fr Kamen and in September his name was on the list of the 40 persons accused of espionage against the People's Republic. Josaphat Chichov was born on 9 February 1884 in Plovdiv, Bulgaria. He was baptized Robert Matthew and belonged to a large family of fervent Latin Rite Catholics. He did his studies at the school of Kara-Agatch from 1893-1899. When he was nine years old, he entered the minor seminary of the Assumptionists of Kara-Agatch. On 29 April 1900 he began his novitiate and was given the name "Josaphat". In 1901 he was made teacher at Kara-Agatch and in 1902 at Varna, where he directed the college's musical band and wrote articles for Bulgarian magazines. In 1904 his superiors sent him to Louvain, Belgium, where by 1909 he completed his studies in philosophy and theology. On 11 July 1909, at Malines, Belgium, he was ordained priest for the Latin Rite. Back in Bulgaria, he taught at St Augustine College, Plovdiv, and then at St Michael College, Varna. He was also superior of Sts Cyril and Methodius Seminary in Yambol. He served as parish priest of the Latin parish in Yambol and was chaplain of the Oblate Sisters of the Assumption. Then he returned to Varna and served there until he was arrested in December 1951 by the Communist militia. He was a man who was full of energy, a man of great erudition who quoted the famous Protestant and Catholic exegetes of the era, a fine musician, a great preacher and a good educator with a fine sense of humour. He had one of the first typewriters with Cyrillic characters, a record player and a film projector to show Pathé-Baby newsreels. He expanded the seminary to take thirty seminarians for both rites, the Latin and of the Byzantine-Slavonic Rite. He celebrated the liturgy one week in Latin and the next in Slavonic. In order to cope with financial needs, he organized collection campaigns and earned money teaching French to teachers, civil servants and officers of the Bulgarian Army. At Varna he started the "St Michael French-Bulgarian Circle" that had more than 150 members, most of them students of Advanced Business Studies, since the town was a port on the Black Sea. He was often the host of Bishop Roncalli who liked to drop into the Seminary for a rest. In 1949 he became parish priest at the Latin parish of Varna. He worked hard in the parish while writing the articles that were published in Poklonnik (the Pilgrim), a magazine for Catholic Bulgarians. The priests also introduced the devotion to the Sacred Heart in the families. He was arrested in December 1951 and there was no news of his whereabouts for a year. On 16 September 1952 his name was on the list when the act of accusation against the 40 accused was published. His life could be summed up in a short sentence in a letter he wrote in 1930: "We seek to do as well as we can in order to sanctify ourselves without seeming to do so". The trial of the 40 Bulgarian Catholic priests, religious and laity, including these three martyrs, began on 29 September 1952 in Bulgaria's Supreme Court in Sofia. Among them was also Blessed Eugene Bossilkov, Passionist, and Bishop of Nicopoli, who was beatified by Pope John Paul II on 15 March 1998. The prisoners were abused and tortured, the recipients of an "act of accusation against the Catholic Organization of Conspiracy and Espionage in Bulgaria". The allegation accused them of being "organized and directed ever since 9 September 1944, an organization whose objective was to invert, undermine, and weaken the popular democratic power through a coup d'Etat, insurrection, revolts, terrorist acts, crimes, and foreign armed interventions". They were also declared "members of an espionage and conspiracy organization, in several of the country's cities, preparing an imperialist war against the USSR, Bulgaria and other countries of popular democrary". The sentence, announced on 3 October 1952, eve of the opening of the 19th Congress of the Soviet Communist Party in Moscow, declared the three Assumptionist religious "guilty of having organized and directed in Bulgaria, since 9 September 1944 until the summer of 1952, a clandestine organization, a secret service agency of the Pope and of imperialists", and condemned them "to death by a firing squad with privation of their rights, confiscating all their properties in benefit of the State". On 19 September 1995 the process was begun for the cause of the martyrdom of the three Assumptionists. Many years of silence passed before it was known whether those condemned had been executed and where they were buried. It was only after the fall of the Berlin wall (November 1989) and the opening up of the archives of the fallen Communist regimes that researchers could discover that they had been shot on 11 November 1952 in the central prison of Sofia and piece together what happened to them after their arrest. The Exarch emeritus who was in jail at the time is still living as are many former students.